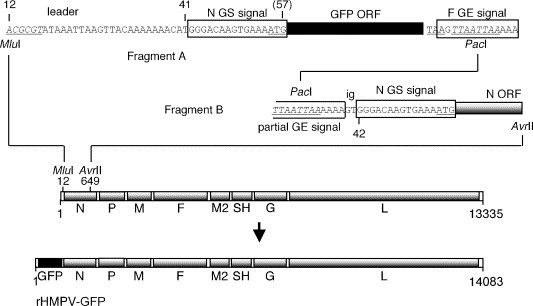 INTRODUCTION: Human metapneumovirus (MPV) is a negative single-stranded RNA virus in the Pneumovirinae subfamily of the Paramyxoviridae family and is closely related to the avian metapneumovirus (AMPV) subgroup C. Two major groups (A and B) and 4 subgroups of MPV have been identified to date. The virus is distributed worldwide and has a seasonal distribution during winter. MPV is the second most commonly identified cause of pediatric lower respiratory illness, behind only RSV. Infection with human metapneumovirus tends to occur in slightly older children and to produce disease that is less severe. However, small children, elderly and immunocompromised individuals are at risk of severe disease and hospitalization. By the age of five, virtually all children have been exposed to the virus and reinfections are common. The genomic organization of MPV is analogous to RSV, however MPV lacks the nonstructural genes, NS1 and NS2. 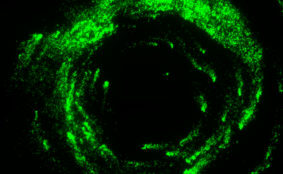 DESCRIPTION: The antigenomic pHMPV83 plasmid was modified by the promoter-proximal insertion of a transcription cassette containing the ORF for enhanced green fluorescent protein (GFP) (Clonetech). 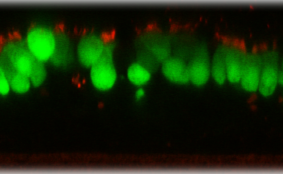 The GFP ORF was flanked by the 16-nt putative N gene-start (GS) sequence and a 14-nt putative gene end (GE) sequence derived from the F gene, followed by a 2-nt (GT) intergenic region identical to that of the N–P gene junction, and the complete N gene, leading to the final construct pHMPV–GFP (Figure). 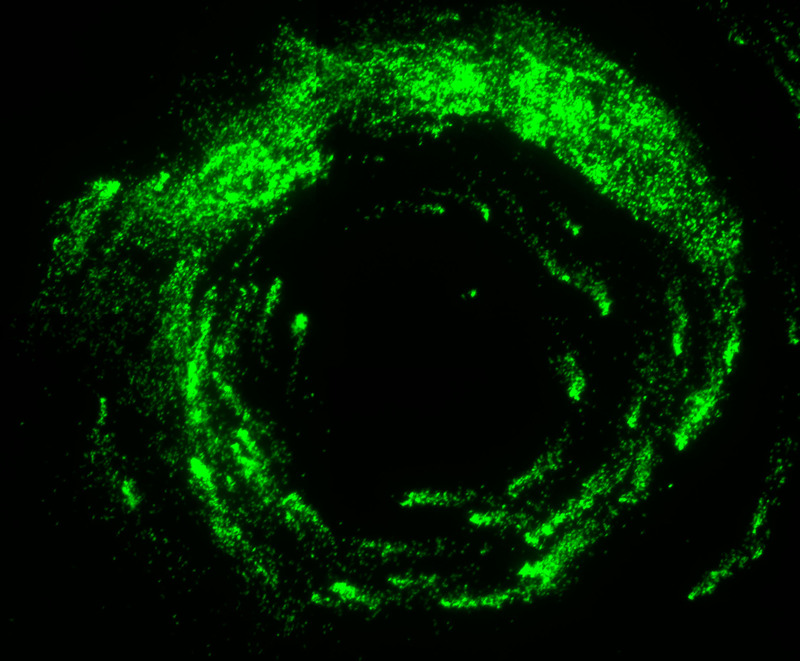 The antigenome plasmid pHMPV–GFP was transfected into BSR T7/5 cells, which stably express the T7 RNA polymerase, together with support plasmids encoding the N, P, L, and M2-1 proteins. 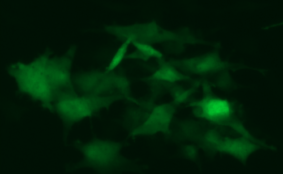 Recovered virus was further passaged with LLC-MK2 cells in the presence of 5 ug/ml Trypsin. 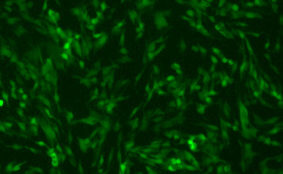 MPV-GFP1 replicated with an efficiency that was similar to that of its biologically derived counterpart. 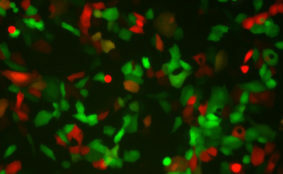 Construction: GFP was inserted in front of N gene as the first gene. 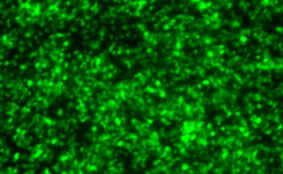 Passage History: The isolate was propagated in LLC-MK2 cells.